Hope y'all have had a fabulous weekend! Tonight I wanted to do a hair post since it's been a while. One of my absolute FAVORITE hairstyles is the pony tail. Believe it or not, there really is an art to it. The varieties of pony tails are endless....but my personal favorite happens to be a high pony tail, with a bit of volume on top and the pony tail itself teased out. The key to hiding the hairband? 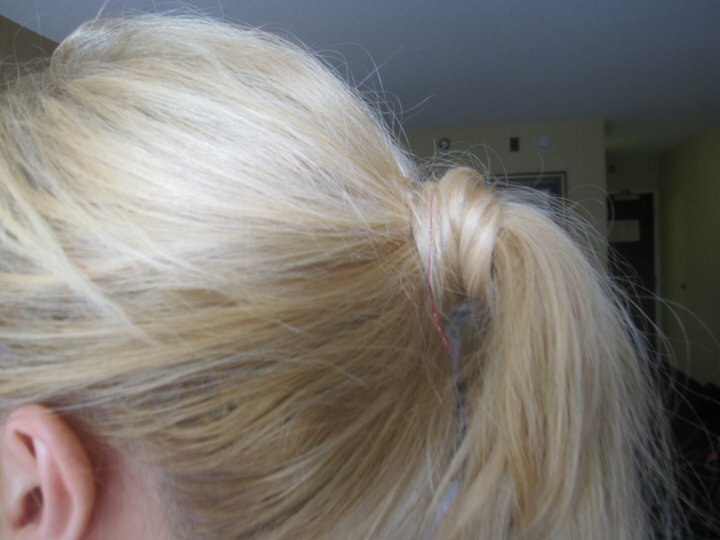 Take a piece of hair from your pony tail and wrap it a few times around the ponytail holder. Put in a few bobby pins and voila, it looks like a fancy updo that took you literally no time! I really enjoyed wearing an easy and worry-free hairstyle for the evening!! What is your go-to hairstyle? What is your idea of the perfect pony tail? Leave me a comment and share! Also, wanted to share with all my blogging friends that one of my sweet friends from elementary school has a new blog. Y'all should check it out---it's SO fabulous! Check it out HERE! Thank you for reading dolls! And if you haven't already, be sure to enter my giveaway by October 1st for the chance to win 3 gift cards to some of my favorite stores! Click HERE to enter!